The CBT1000 by JBL Speakers by Harman JBL by Harman introduced the CBT1000 series adjustable coverage column array loudspeaker at InfoComm 2016. 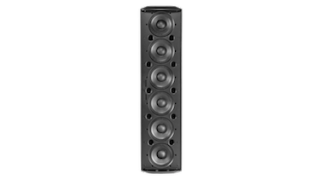 The CBT1000 is an extension of JBL’s popular CBT (Constant Beamwidth Technology) column array loudspeaker line, offering substantially greater output, deeper bass response, and more advanced adjustability of the coverage pattern. The CBT1000 full-range cabinet and CBT1000E extension cabinet provide versatile, adjustable vertical pattern selections for aligning the coverage to the geometry of a room. Independent selection of four “pattern up” coverage angles and four “pattern down” coverage angles combine to provide 16 different vertical coverage combinations. In its asymmetrical settings, CBT1000 sends more sound toward the far listeners, helping to counteract sound level differences between near are far listeners, while simultaneously being capable of providing smooth down-fill that doesn’t overpower those in the front. In the horizontal plane, the system’s patent-pending horizontal gradient waveguide provides tapered coverage to reach the front and rear corners of the room while minimizing over-splash. Combined with a bass response below 40Hz, the CBT1000 system provides clear and powerful full-bandwidth coverage of a room from a single loudspeaker. Twelve 6.5-inch high-excursion, low-frequency drivers and 24 high-power tweeters give the CBT1000 line array system the capability of delivering 130dB continuous output with 3000 watts of power handling for high-output applications. The CBT1000 series is designed to offer a single-speaker solution for venues that might otherwise use larger point-and-shoot speakers. It incorporates technical advancements that provide a level of user friendliness that simplifies the challenges of delivering great sound.